REMODELING, yes, we do remodeling too. This house in Greece, NY needed a lot of work. The rear portion was literally falling down. Portions of the roof were rotted right through and water damage was extensive throughout the house. Most floor joists were beyond saving, wall studding was wet and rotted, drywall was wet and mold damaged. This was not overnight damage, it was due to 15 years neglect and water leaks from the roof. The primary cause of the water leakage was bad flashing at the brick chimney. Water leaks are sometimes hard to pinpoint and not always apparent. We spent some time and with our knowledge and experience we were able to determine the source. After consultation with the owner and a estimate of the cost, he decided he wanted to rebuild the entire room. And he wanted us to do the job. Flooring and walls on this house were damaged and rotting from water leaks due to bad flashing on the roof. We replaced the entire roof including a complete tear off, right down to removing and replacing the roof rafters, raising the roof by 10", re-pitching the roof line to 4/12 for better water shed and to prevent ice damming. We sheathed the new roof with Anvantech 3/4" tongue and groove heavy duty plywood for strength. After flashing the roof correctly we then used GAF 3-tab asphalt shingles to cover the new roof. 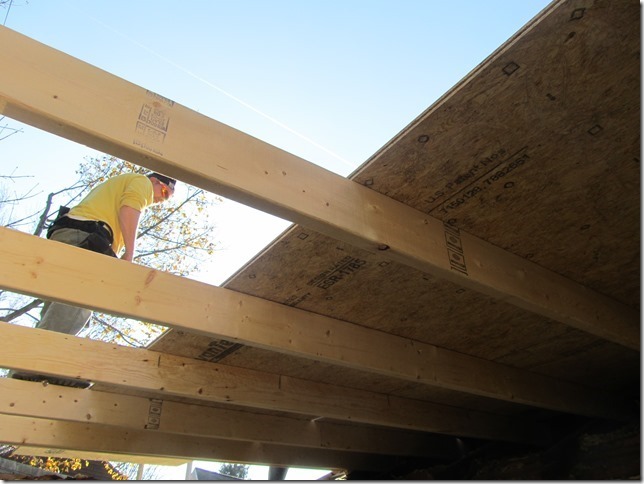 We also added a 12" soffit to the outside, vented the roof properly above the insulation also to prevent ice damming. As the rear wall of this home was also damaged beyond repair we tore out the entire wall and built a new one. We added a nice custom 42" x 57" Anderson Double Hung window for the owner while we were at it and insulated the walls correctly.